New classes are being offered this year. "Dress Up Your Salads" on July 20 presents simple recipes for salad dressings and toppings that embolden and brighten your lettuce dishes. "Power-Packed Breakfasts" is also new and will be offered later in the year. Lenore takes the mystery out of superfoods and shows you how to easily incorporate them to kick-start and embolden your day. Naturally-Fermented Sauerkraut and Fermented Beet Kvass workshops are being repeated on May 18th. If you are an Osher Life-Long Learning Institute - Asheville member, look for "Exploring Healthy Habits" during this summer 2019 term. Welcome to the website of Lenore’s Natural Cuisine, where Lenore Baum shares her understanding of conscious nutrition and secrets of healthy foods and their preparation. Her wisdom comes from 35 years of training and of operating her natural foods deli and vegetarian cooking schools in Arizona, Michigan and North Carolina. 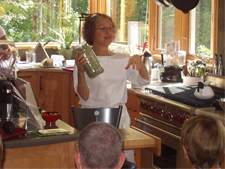 After completing a sabbatical in 2008, when she continued to evaluate current scientific and health studies, she revised her curriculum to feature her passion for raw and living foods preparation. 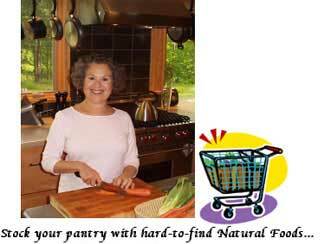 Read the article about her early journey to natural foods cooking in the July 2006 issue of WNC-Woman magazine. To find your way to the wealth of practical information on this website, see the site map. 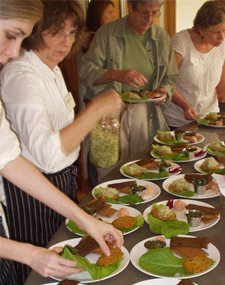 Lenore’s Natural Cuisine is a cooking school featuring low-glycemic, gluten-free, wheat-free, raw and living foods preparation. 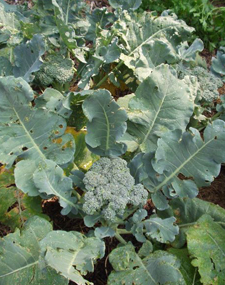 Every class is jam-packed with indispensable information and includes a meal prepared with organic, garden-fresh vegetables and herbs harvested in the morning. You can read several articles about her classes in the WNC Magazine and Asheville Citizen-Times business profile. Raw, living vegan foods retain their life force and include unprocessed fruits, vegetables and sea vegetables; sprouted beans, grains, nuts and seeds; fermented foods and low-temperature dehydrated crackers, sprouted bread and treats. These foods are easily absorbable by the body and abundant in vitamins, minerals, enzymes and protein. Furthermore, since you will be eating such nutrient dense foods and automatically displacing processed and empty-calorie foods, you will easily achieve your optimal weight. A vegan lifestyle not only boosts your health, but is also a major personal step in reducing global warming. Completed in 2006, this contemporary, Asian-inspired school is situated in a serene Weaverville setting on 17 acres just outside of Asheville , North Carolina. Lenore and her husband Joe embrace sustainability and simple living principles. 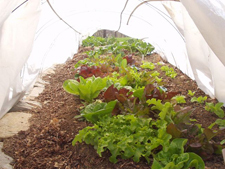 Gardening organically year round, they raise most of their food in terraced garden beds located close to the kitchen. Their school/home has a passive solar design, solar domestic hot water and heating, solar electric panels and many other sustainable features. See the WNC Green Building Directory article and the Blue Mountain Living article.